Moving day always has the potential to go terribly wrong--inconveniences can arise due to a number of factors and make your already stressful experience even more frustrating. However, proper preparation, research and knowledge can greatly decrease your chances of encountering trouble during your move. To ensure your truck rental move goes smoothly and without mishap, read on for some tips on avoiding common problems. When renting a truck for your move, it's important to make sure you schedule your reservation in advance. A common problem for DIY-ers occurs when waiting until the last minute to make a truck rental reservation, especially during peak season--only to find the company is all booked up. If you are planning a move during the summer or at the end of the month, be sure to reserve your truck at least two months in advance. Another common problem occurs when a rental truck agency is not reliable and doesn't hold your reservation. Angry customers have complained about making reservations, only to discover there is no truck held for them on moving day. To avoid becoming a victim, be sure to conduct a thorough background check on any truck rental company before using their services to verify they are reputable and trustworthy. Handling a cumbersome moving truck can be difficult for drivers inexperienced in operating large vehicles. Driving a moving truck should be done with extra care and caution to avoid accidents and other problems on the road. To ensure your trip goes smoothly, be sure to plan your route in advance to adjust for road weight restrictions and low bridges that will not accommodate your truck. Always take turns slowly, use your signal, and check your mirrors before changing lanes. Rental truck companies may tack on hidden fees not included in your initial quote. Always read the fine print in your rental agreement and ask questions before signing. You maybe be quoted a flat rate for your truck, but incur extra charges for mileage, late return, moving tools, and fuel costs. You will often be charged more for a "one-way move"-- if you are moving long distance and have to return the truck to a different location, you may be charged a higher rate. The ultimate cost of your rental truck depends on a variety of factors--getting the best deal requires thorough research and knowing the right questions to ask the truck rental company. The last thing you want is to wind up stranded on the side of the road with a truck full of your belongings. For your personal safety and the protection of your goods, a well-running rental truck is essential. Transporting your shipment cross-country in a sputtering jalopy will only ensure more headaches and stress during an already exhausting experience. When you arrive at the agency on pick-up day, be sure to thoroughly inspect the vehicle before signing any papers. Ensure that any physical damage, interior or exterior, is clearly documented on the inspection sheet so you cannot be blamed for it later. Ask questions about the truck's history, any accidents it was involved in, and the dates of its last service. A major roadblock on moving day occurs when you load up your truck and find that you underestimated the volume of your goods. Having a lack of storage space to transport your belongings can wreak havoc on your moving schedule. Will you have to make two trips? If you are moving long distance, this may not even be plausible. Determining the size truck you should rent can sometimes be tricky. 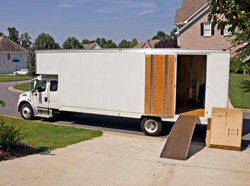 It's always a good idea to rent a moving truck at least 10 to 15 percent larger than what you expect you'll need. Even if it means spending a little more money--you'll be grateful you did if you realize later that you needed the extra space. Additionally, having a little more room on the truck allows you to properly load your belongings so that they remain safe during transit. Always conduct a thorough background check on any company before choosing one to supply your truck rental. Check profiles on the Better Business Bureau, scan websites such as Ripoff Report and MovingScam.com for outstanding complaints, and verify the company's US DOT number on the FMSCA website. Reading customer reviews for truck rental companies is helpful for determining the quality of their customer service. You can read moving reviews at Movers.com, or check out customer ratings on websites such as Yahoo Local and Yelp. Never be afraid to ask too many questions before making your truck reservation. The more you know, the less vulnerable you are to scams or unethical business practices. Be sure to ask about any added fees, reservation guarantees, and truck conditions. Always get at least three estimates from three different companies before choosing one for your move. This will allow you to compare your options and choose the company that offers you the best price and service. Remember, don't always go with the cheapest option--if the quote is too good to be true, it probably is! 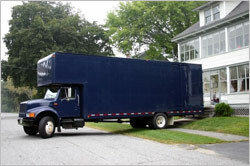 Begin comparing quotes from truck rental companies for your move today at Movers.com! Just fill out the fast and easy quote form and save!